Michigan was screwed by the refs, but that wasn't the only flaw in The Game. As I stood in the back of the north endzone in Ohio Stadium right in front of the Michigan Marching Band, 110,000+ people screaming around me in maybe the loudest sports moment I've ever witnessed live, Wilton Speight dropped back and found Grant Perry in the back of the endzone for a 4th down touchdown that sent it into a second overtime. I have seen some clutch throws in my life, a few in person, but I don't know if any will ever top that one. On the road, insanely hostile environment...The Game on the line. Doesn't get any bigger than that. After that, I thought we had it won. Regardless of whether the spot was correct or not (it wasn't, but whatever), the notion that a game (..."of this magnitude", as Chris Fowler put it during the broadcast) shouldn't end on an overturned spot is insane. Why does it matter if an overturned call ends the game? The call on the field was wrong, one team was robbed of their victory and the other team was given a change it didn't deserve. Missed holding calls, inconsistent pass interference calls...the tackle of Amara Darboh that wasn't called is the most egregious by far. The personal foul called on Jim Harbaugh because whatever he did that upset the ref, I think it was throwing his script into the air...he was told would've been a technical foul in basketball because that ref also officiates basketball?! I mean, how many times does a team need to be kicked in the nuts by the officials before the other team wins? We found out on Saturday. Now, I understand Michigan had just as many self-inflicted wounds as they did ones from the refs. Driving to put Michigan up 24-7, the fumble at the one yard line was awful. That was a huge momentum swing. In the end, Michigan gave up 14 points off of turnovers. In a matchup as close as this one was, that's the ball game, regardless of Ohio State's own blunders which were numerous. Michigan's defense, which was one of the best in the country in sacks per game at 3.27, had 8 sacks on JT Barrett. They completely shut him down. They essentially gave up 3 points to an offense that averages almost 44. Say what you will about everything else, Michigan's defense showed up big time. What this game came down to, for me at least, was Michigan's inability to put an opponent away in the 4th quarter. We had no ground game whatsoever in the 2nd half. Just like against Michigan State last year and Iowa this year...two other games Michigan lost on the last play of the game...we just couldn't run the ball to move the chains and run out the clock. The Jabrill Peppers wildcat packages didn't fool anyone and seemed to be thrown in at odd times. The play calling was good, but as the game wore on and the momentum started to swing, Michigan became more and more one-dimensional. Jim Harbaugh is a tremendous coach, 20-5 through his first two seasons so far at Michigan, but this is a disturbing trend in close games against good teams. 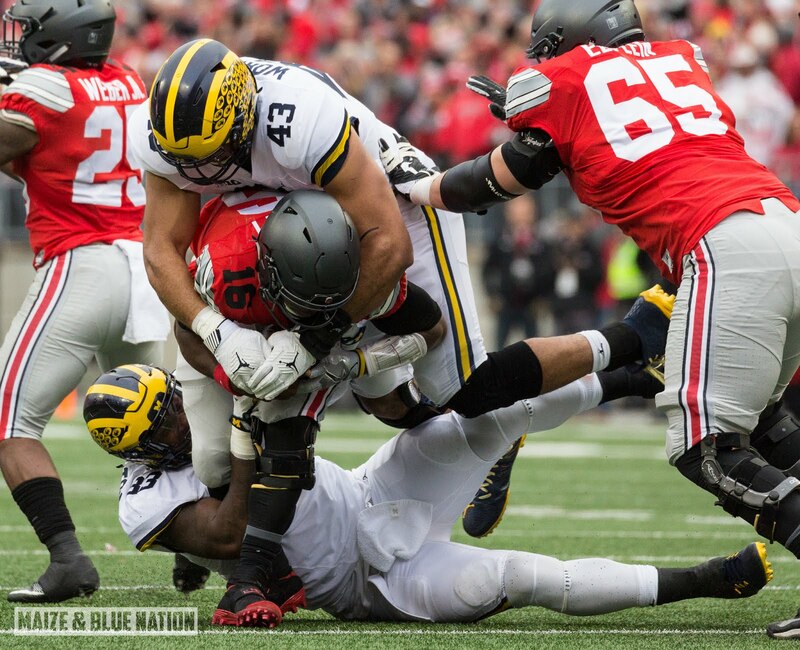 The ability to dominate an opponent with a stout running game is a Michigan staple that goes back generations. We don't have that right now. Call it remnants of the previous coaching staff, Michigan's senior dominated offensive line isn't getting the job done well enough to go into places like Columbus and put together a complete game. We can sit here and point to many things as to why Michigan lost, but this is the most important because it's the one thing Michigan can control. And I think this gets addressed going forward into next season with some new bodies up front. For now, Michigan is probably on outside looking in for the college football playoff. I suspect they'll be ranked 5th tomorrow evening. If Colorado beats Washington on Friday night, that's going to help Michigan's chances. 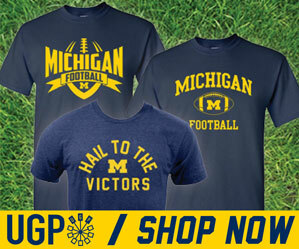 An argument can be made that Michigan is still a top 4 team nationally. Once all of the championship games shake out, we'll know more. I think it's going to be close.